Metronome Le Player review | What Hi-Fi? Don’t know Metronome? The company was founded in 1987 by Dominique Giner (who still designs the products) and is based in Toulouse in France. It’s a brand best known for its exotic-looking high-end digital creations. The term ‘entry-level’ is normally used for a cheap product, but that description certainly doesn’t apply here. For Metronome, entry-level means Le Player – a chunky 15kg aluminium-clad unit that promises a large slice of the performance of its pricier siblings, but at a fraction of the cost. The company’s flagship transport/DAC combination, the Kalsita Ultimate SE/Nausicaa, costs around a dozen times as much, so if that holds true Le Player could be a bargain, in high-end terms at least. Things start off well. While offering none of the outlandish aesthetic treats of other (much pricier) Metronome products, Le Player is still an imposing unit once placed on our rack. It has to go on the top shelf because this is a top-loading design – none of your rickety plastic loading trays here – and any other level won’t leave enough space to load the disc comfortably. Even so, we’ve always liked top-loading CD players. It makes them seem more exotic and adds some of the ritual of using a turntable into the deal. Here, you slide back a thick aluminium lid, exposing the CD spindle and laser mechanism. While the transport is a Philips GF8 unit, it’s modified by Metronome and now features a revised motor spindle (to improve stability) and a magnetic puck made mostly of Delrin (a highly-crystalline polymer). The nicely shaped puck is there to ensure the disc is held securely on the spindle – make sure you don’t lose it; the player won’t work without the puck in place. The whole transport assembly is mounted on a Perspex support to help control resonances. There are two large circular cut outs on the top surface to provide clearance for fingers when putting the disc in. It’s a nice idea but their placement didn’t suit all our reviewers. As would be expected at this level Metronome has taken a lot of care with the power supply arrangement. 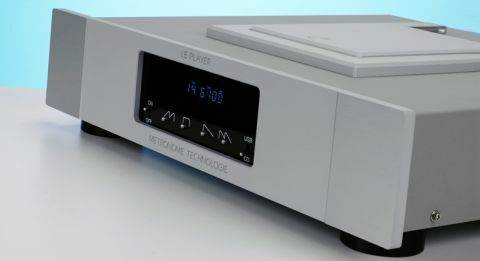 The configuration used in Le Player is made up of no less than three mains transformers and seven discrete supply lines. The idea is to prevent degradation of performance caused by interference between the various analogue, digital and control sections of the circuitry. The rest of the Metronome’s chassis is as solidly built and nicely finished, as you’d hope. The only colour option is silver at the moment. The front panel control layout is simple with just the basic transport functions accessible. It’s a shame these buttons aren’t particularly precise or pleasant to use though. At this price there is no excuse. This shortcoming makes it all the more important that the remote feels so nice. It’s not a particularly flashy wand, but the clear layout and sensibly positioned (and sized) buttons make it a pleasure to use. We think the display is pretty clear too, though the mix of upper and lower case letters makes it look like a relic of the 90s. Still, at least we could read it from the other side of our test room. Look around the back of Le Player and you’ll find the usual single-ended RCA and balanced XLR analogue outputs alongside a coax digital output. Don’t be surprised if you find the Metronome sounds a little louder than normal. Its RCA analogue outputs are set to an output voltage of 2.5v rather than the more usual 2.0 volts, so make sure you compensate for this in any comparison. Usually, the louder option tends to impress more, on a short listen at least. The back panel is also home to the USB input. This opens up the player’s internal DAC to computer sources, and that can only be a good thing. Not only is Le Player’s internal DAC circuitry likely to be much better than that used in most sources, but such an input also offers a degree of future proofing. That’s something to bear in mind when you’re thinking of spending so much money. The USB input is an asynchronous design where the Metronome takes charge of the timing of information flow between it and the computer. In theory, the clock in the player will be more accurate than that used in the partnering computer, which should lead to a better sound. The USB will accept signals up to 24bit/192kHz, but you’ll need to load the dedicated software drivers onto your Mac or PC. These are included on a disc, supplied with the machine. Normally the drivers built into a Mac computer operating system tend to be compatible with most outboard DACs we’ve tried, but in this case our laptop didn’t even register the Metronome until the correct software had been installed. Everything runs smoothly after that is done. Our review unit had what seemed to be a misadjusted sensor on the CD lid. At times we had to open and shut the cover a couple of times before the player would work. But given that ‘our’ player had clearly done the rounds before getting to us, we’ll give Metronome the benefit of the doubt. The player didn’t take much time to come on song. Given a couple of hours it delivered a lively and entertaining sound that kept us hooked throughout the test period. We start with an old jazz favourite in the form of Bill Evans’ Everybody Digs Bill Evans. Here the Metronome delivers a terrific performance. Peace Piece is a slow burner and the Le Player renders the music with all the finesse it deserves. We’ve heard this piece delivered in a more relaxed way, but there’s much to like about its more direct and communicative approach. There’s a pleasing solidity to Evans’s piano and superb insight into the instrument’s rich harmonic envelope. There’s power too, as and when the playing demands. We like the way the Metronome maintains the delicate forward momentum of the music – this is something that can so easily seem stagnant through lesser kit. Tonally, things err a little towards leanness in our system, but not so much as to be an issue in a balanced set-up. There’s plenty of weight and authority on offer, but the emphasis here is on agility and articulation. This is a responsive performer that defines transients with crisp precision and control. Those qualities are made all the more obvious when we load Tchaikovsky’s 1812 Overture into the disc compartment. Le Player takes the wild dynamic swings in stride, delivering them with a spellbinding combination of composure and drama. There’s plenty of attack here, but also top class refinement that stops things going too far. The Metronome’s sense of organisation is impressive, as is its ability to keep track of low-level instrumental strands even when the piece becomes demanding. It’s this ability to keep control yet avoid sounding controlling that’s so impressive. On this recording the sound staging is suitably stable and layered. The Metronome doesn’t make as much of the space between instruments as some, and the sense of depth isn’t quite as expansive as it could be, but neither of these things are enough to spoil our enjoyment. We try a bit of rock next in the form of Bruce Springsteen’s Radio Nowhere, and again the Metronome shines. It’s fast, punchy and latches on the song’s hard-charging rhythm track with glee. The production is pretty dense, and hardly the cleanest around, but the player communicates the drive and energy brilliantly. There’s plenty of power in the bass and an impressive dose of attack throughout. If you’re looking for a fun listen this one will keep you happy. Worried that all this good work might be undone by the USB input, we connected our resident MacBook Air (loaded with Pure Music software) and pressed play. It turns out we had no reason to doubt, the USB sounding as convincing as the CD section. Playing a range of files from intimate pieces such as Beethoven Moonlight Sonata (16-bit/44.1kHz) through to dynamically demanding works such as Hans Zimmer’s Gotham’s Reckoning (24bit/192kHz) and Kanye West’s Yeezus (16-bit/44.1kHz) the Metronome continues to sparkle. Its combination of agility, insight and rhythmic precision making the most of the music played. Le Player may lack the sheer visual drama of its pricier stable mates, but its sound is one to treasure. Ergonomics aren’t flawless, but the overall packaging is a tempting one indeed. If Metronome’s entry-level sounds this good, we can’t wait to hear what the company’s upmarket models sound like.